Upon all the efforts the world is putting in human right abuse awareness especially racism, there are still influential personalities who are making the issue worse. The issue of racism is being discussed today (June 6) on social media when a screen grab of a racial attack comedian DKB launched on a ‘white’ fan found itself on Facebook. On Sunday, June 5, the comedian took to Twitter to express his ‘bias’ views on religion where he described anyone who do not believe in the Gospel as ‘stupid’. 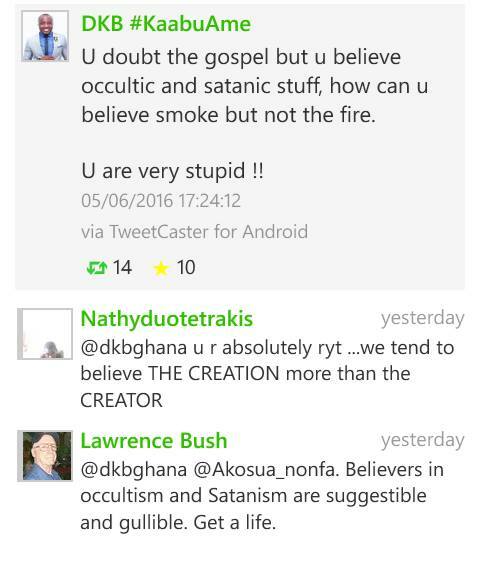 “U doubt the gospel but u believe occultic and satanic stuff, how can u believe smoke but not the fire. U are very stupid! 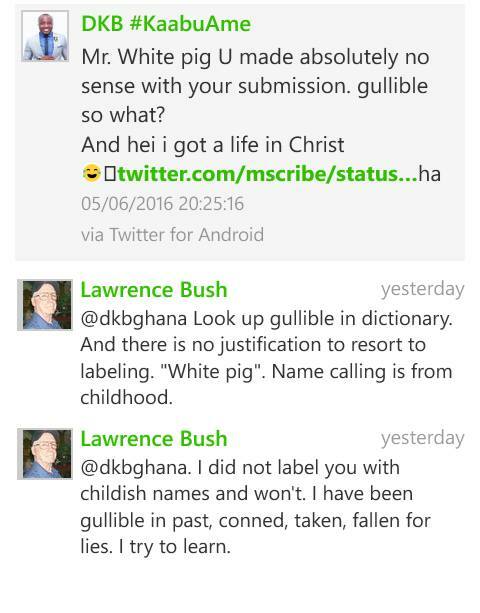 !” DKB tweeted. And I think it didn’t go down well with him so he took it personal and launched an attack on his fan describing him as a ‘White Pig’. “Mr. White pig. You made no sense in your submission. Gullible and so what? And hey, I got life in Christ,” you can’t imagine DKB said this. The Twitter even in his response came out maturely and his approach looks good. I wonder what DKB was thinking and why he would offend an innocent person all in the name of religion. The tweep deserves an apology from DKB! Let us have your views below.